It's the $7 trillion question hanging over Australia's economy — property boom and correction or bubble and bust? For those warning of the latter, Ireland and its spectacular implosion during the global financial crisis offers a salutary warning of what may lie in wait Down Under. "I am concerned we could be seeing an Ireland 2.0 here within the next 12 to 18 months," warned Martin North, the principal at Digital Finance Analytics. Mr North caused quite a stir with a recent appearance on 60 Minutes where he discussed the possibility of a 30-45 per cent property price crash in Australia, although he rates that as only a one-in-five risk, with a still-large 15-30 per cent fall his base case. But Alva Devoy is not concerned. The managing director for the local arm of global funds management giant Fidelity came to Australia from Ireland in 2009 and witnessed firsthand the causes of, and fallout from, the Celtic Tiger's crash. Speaking at an event to mark the launch of a Fidelity emerging market fund, Ms Devoy noted Australians' extreme financial concentration in the housing market, through direct or super investments in the major banks as well as home ownership and property investment. While urging more portfolio diversification and admitting that "all of the metrics [in Australia] are telling you this is a massive bubble" — such as high debt-to-income, price-to-income and price-to-rent ratios — Ms Devoy added, "there are huge differences … the differences are incredibly important". "The Irish central bank was importing monetary policy that was being set for Germany and for France, so we had been experiencing for some years GDP growth of 7 and 8 per cent and we had rates down at 2 and 3 per cent," she said. "It was free money, so everybody became a property developer and borrowed and either built another house in their garden or invested in holiday homes and the actual rate of construction was two times the demand. You cannot say that about Australia." Mr North only partly agrees, saying "there are some differences and there are some parallels". "If you actually line up the various factors that were there in Ireland in the year or two before things fell over and then compare them here, I think there are more parallels rather than differences," he said. "There was very loose monetary and indeed lending policy in Ireland, well we've got that here, with very low interest rates and very loose lending up until recently. "There was a very significant run-up in the construction sector in Ireland and in fact all the first home buyers over there were buying directly into the newly constructed apartments — and of course it was the construction sector there that triggered the fall that then spread out beyond that. "Here, I think construction is still a very significant risk and we are seeing a lot of newly built apartments now not selling, we're seeing a lot of developers now in difficulty." Like Ms Devoy, Sydney University economics professor Colm Harmon also hails from Ireland, where he was a professor of economics at University College Dublin between 2003 and 2012. Unlike Ms Devoy, he sees far more similarities between the Australian and Irish housing markets. "The biggest parallel — as the Hayne commission is unlocking — is the role of cheap credit and loose lending," he told said. "Interest rates will tighten and the capacity to absorb that will be key, as will the conversion of interest-only [loans] to interest and principal. "I see the latter as the big unknown — the exposure to interest-only is off the scale in Australia. "What is also unknown here is the extent to which borrowers are already in negative equity — in other words had borrowed to the max, and had borrowed too from parents and family but under the radar." Professor Harmon sees some of Australia's differences with Ireland as adding extra risks to the housing market Down Under. "Speculative investment by Irish was often overseas — we never had anywhere near as big an investment issue as Australia does in terms of 'mom and pop' investors," he observed. "Then again, we never had the insanity of negative gearing — in Ireland you did have property investors but they tended be somewhat 'professional' because the tax treatment means you could only carry losses against the same class of asset." One numerical comparison that is enlightening is the rental return on homes versus the purchase price, known as the yield, to see how expensive Australia is compared to Ireland. A lower yield means buying a property is relatively expensive compared to renting, often a sign the market may be overvalued. An analyst research note from early 2006 put Dublin's gross yield in a number of booming suburbs between 1.4-3.2 per cent. "Property is a risky asset, like equities, corporate bonds and commodities. Net yields of 1.5 per cent, which are commonplace in Dublin, look ridiculous compared with a risk-free rate of 3.5 per cent on ten-year gilts [government bonds]," he noted. "The fundamentals suggest that it will be an adjustment in prices, rather than rents, that will eventually bring valuations down to more realistic levels." Sydney and Melbourne currently have gross yields, across houses and apartments, of 3.2 and 3.1 per cent respectively, a bit higher than peak bubble in Dublin and than the current Australian 10-year bond rate of 2.7 per cent, but still a very low return compared to other investments. "Ultimately the best gauge is how rents are out of sync with prices — most folks could not afford to buy the house they are renting — that is not a long-term situation that can persist even allowing for the distortion of negative gearing on rents," Professor Harmon concluded. 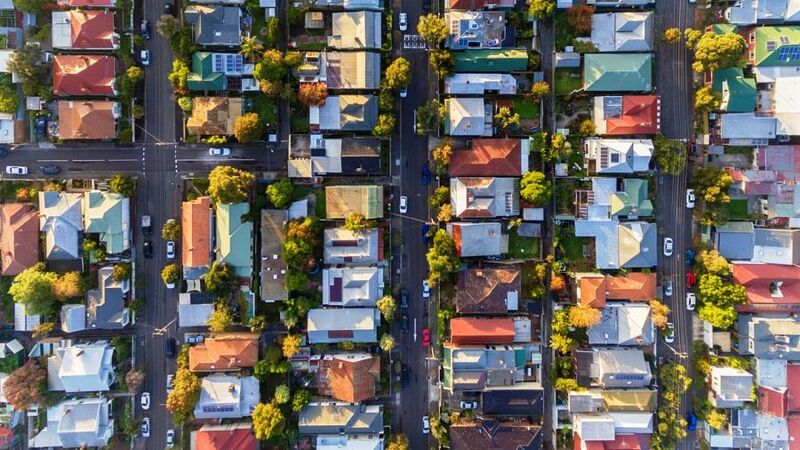 However, Ms Devoy believes Australian policymakers have been more alive to the risk of a housing bubble, and bust, and have taken steps to prevent the latter. "What the RBA, what Treasury has managed to do, and Government as well, is twice in the time that I have been here is mobilise the workforce from one area to another area," she said. "We rolled off employment in the mining sectors and mining-related sectors and we picked up employment in these sectors around construction, predominantly residential." Ms Devoy says there is now a switch from residential building to infrastructure construction, which will continue to keep unemployment in check. As several analysts have pointed out, Australia also has the benefit of a freely floating exchange rate, while Ireland was tied to a euro that was too low during its boom and became far too high for the country after its property market and economy started crashing. "We have a free floating Australian dollar which acts (and has done since 1983 both down and up) as a shock absorber when the economy needs it, so smoothing out and ameliorating the economic consequences of any funk," observed AxiTrader chief market strategist Greg McKenna. Ms Devoy sees the fall in home prices as a positive, deliberately sparked by financial regulators to take some excess heat and risks out of the market. "While we have seen house prices roll over I think actually it's an incredibly healthy outcome," she said. "We have done that by a purely macroprudential approach … we have taken heat out of the system without raising our rates. "That's incredible, especially given that we know the level of indebtedness in this country is big and something to be worried about." High household debt levels — around 190 per cent of incomes — present a major risk in the event of an international financial crisis, just as the closure of global money markets put the final nail in the coffin for Ireland's heavily leveraged banks in 2008, causing the ultimate capitulation in that nation's housing market. Professor Harmon agrees that Australia's regulators have been somewhat more on top of the nation's housing bubble than their Irish counterparts were. "APRA, the RBA and Treasury know what they are doing and act independently of the Government and have done for a long while — that was not true in Ireland to a large extent," he said. "These agencies [in Australia] were late to act on housing costs but, of course, there is more to the housing market than Sydney or Melbourne. But they have [acted] now and that will help." Digital Finance Analytics regularly surveys thousands of households, with its most recent data released today, and it has noted a dramatic drop in intentions to transact in the housing market. For the past four years, 60 to 70 per cent of portfolio property investors have said they are likely to transact over the next 12 months, but this has recently plunged to just 20 per cent. Solo investors have also become much less likely to transact. This has opened up opportunities for down-traders and first time buyers, who are both more likely to transact over the next year. Something that Ms Devoy has observed. "Transactions are continuing to happen but they've been happening at a lower price," she said. "There's oxygen in the system and the buyers are setting the price now." However, Mr North said that many first home buyers, though now willing to buy in the falling market, are struggling to get finance for their purchases. "I've never had data that's showing more people are struggling with getting finance," he said. "About 40 per cent of first home buyers are now saying they cannot find finance for the purchase that they want and, if you go back two or three years, again that was down to zero." Digital Finance Analytics data show that down-traders are the most active participants in the market, with most wanting to sell. Mr North said they were mainly expressing a desire to lock in the capital gains they have made over recent years amid fears the market would keep falling. "We've got this confusion between people wanting to sell and yet also people not being able to buy," he said. "And that's why I'm calling that we're going to see further weakness in the housing market over the next 12 to 18 months."